As I mentioned in past posts, we are undergoing a major bathroom makeover on our upstairs bathroom. I’m happy to report that it will be done within the next few weeks. John is injured so the renos have been slow-going, but we hired a carpenter to come this week and finish it up completely. I cannot tell you how happy that makes me. Gone are the ugly pink walls and it will have a fresh, modern look. I can’t wait to show you all the transformation. I’ve previously discussed easy ways you can freshen up your bathroom without completely gutting it like we did. You can update your bathroom with tile or upgrade your showerhead to change the look and feel of your bathroom. Today I wanted to discuss another easy way to transform the look of a tired bathroom: update your vanity! A vanity is one of the first things you see when you walk into a bathroom. Having an old, damaged and outdated vanity can really affect how the space looks and feels. I know this first hand because we have a hideous looking vanity in our downstairs bathroom. It’s straight from the 1970s. Mind you it matches the rest of the 70s chic decor, and I know a new vanity would make it looks a million times better. If you have a limited budget for your bathroom upgrade and want to go for something that will make a big impact on your space, then change your vanity! The Home Depot has a variety of vanities to choose from, whatever your budget. There’s the Cutler Kitchen & Bathr Textures Collection Wall Hung Vanity in White that would look really sharp and match any colour scheme you have. It’s wall hung which is something I don’t see often but it looks like its very functional and easy to clean. I love how modern it is. There are also the more traditional bathroom vanities like the Foremost International Teagen 42 inch Vanity Combo and Fresca Oxford 60 Inch Antique White Traditional Bathroom Vanity with 2 Side Cabinets. I love how they both offer lots of storage and have a classic, elegant feel. 1. Budget. Decide how much you want to spend on a bathroom vanity. They range in price from $200 to $3000+. You can easily search on The Home Depot website for the vanities that are in your price range. 2. Storage. Think about how much storage space you’ll need in your vanity. Do you have a lot of items that you keep in your bathroom? If so, then consider buying a vanity with more drawers. 3. Size. How big is your bathroom and what size of vanity will fit in the space? You have to make sure you don’t buy one that is too big if you have a small bathroom. If your bathroom is large, you don’t want to get one that looks out of place because it’s too small. Know these measurements before you start looking! John and I made the mistake of buying a vanity that was too big for our little bathroom. My suggestion is do your homework first and save yourself some headaches! 4. Style & Colour. Decide on what look you are going for in your bathroom. Do you like a modern, contemporary look or do you prefer a more traditional space? Then there are options like a pedestal vanity, corner vanity or wall hung vanity. There are lots of choices I know, but thankfully The Home Depot has an easy way to search through all your options on their website. The Home Depot also has a tutorial on how to install a bathroom vanity. It lays out step-by-step instructions with the materials and tools you’ll need and what you need to do to complete the job. Another way to freshen things up is to update your current vanity by adding some paint, new pulls, taps and maybe even a new countertop! It’s amazing how much a little bit of paint and hardware updates can do. I’ve actually done this myself on old desks, shelves and dressers and it’s so easy and doesn’t have to cost a lot of money. It’s also rewarding to see something you’ve transformed into a beautiful piece. The Home Depot has a variety of DIY Workshops that I encourage you to check out. You won’t run out of ideas of projects after visiting this section! Have you entered my giveaway for a $500 gift card to The Home Depot and a consultation with a local associate about renovating a bathroom? It ends on November 3 and is open to Canada only (excludes Quebec). There’s still time to enter so don’t miss this one! The bathroom is one room that should be modern, I love the collage of choices. I love all of them! We need a new vanity in our bathroom in the worst way. Love these pretty choices. this is exactly how my daughter upgraded her downstairs bathroom. It’s amazing what a difference it makes in the overall impression. A vanity really can change the look and feel of your bathroom! We were very eager to get new vanities in our home when we moved in and it made a world of difference for vary little cost. Nice vanities, I would like one for my bathroom. Great ideas. Love these vanities! We just replaced ours a few years ago. We have a small bathroom so we were really limited by size because we wanted to maximize the space in our bathroom. I agree that changing up the vanity can definitely make a huge difference in a bathroom! One day I want to redo the one in our powder room! It really is a huge difference in changing out the vanity. It can change the whole look of your bathroom. And then inspire you to change out other things. I hate both of our bathrooms. I’ve love a new vanity, and maybe a new toilet. I miss our old one, it was so nice, but we had to move. I would love to have a nice modern vanity in our bathroom. It really is the focal point of the room! 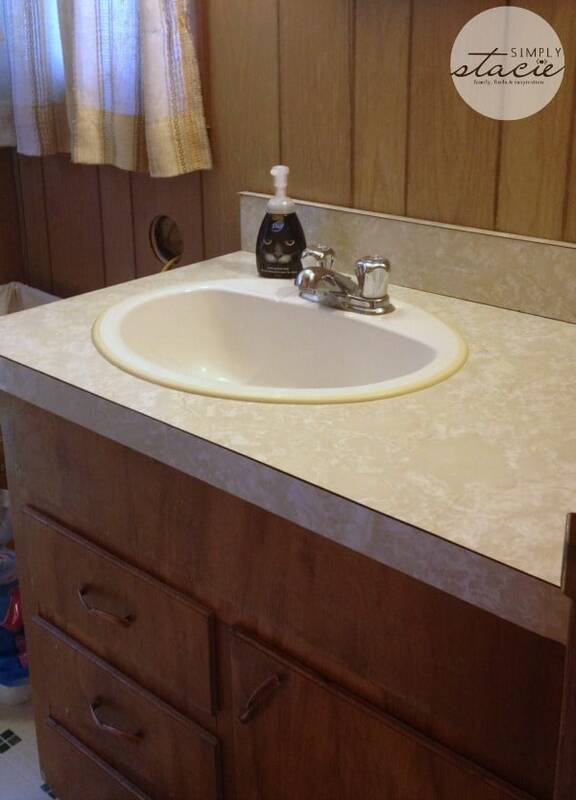 I like the either the white or black vanities here; the brown one looks very functional though. Storage is so important in the bathroom so I need something that can hold a lot. I’d love a new vanity in our bathroom, might have to make it a project for spring! Love the Dial Halloween soap in the first photo! The black cat one is my favorite too. My best boy is a fluffy black cat, but Malakai has been missing for seven weeks now. Hope he is staying safe and dry out there. Hard to beleive what a difference a sink can make! Thanks for the post. These are very nice.Its about time ours was replaced. It’s amazing how changing one piece really upgrades and changes the feel of a room. Our main bathroom has a nice vanity for storage but the wood was stained and the old oak didn’t go with the changes my daughter had made. She painted the room a dark purple with splashes of black, silver, and white. We recently decided to pain the vanity black and wow…now it brings about a pop when you enter. My husband even sprayed the hardware purple to match the walls. It really ties everything together. I know yours will too. Good luck to you with all the upgrades. Have fun! This does look like a good way to update things when you’re not quite up to a full remodel. I know I could use more storage space in my vanity! Gettign ready to add a full bathroom ot our first floor. I have MS and neeed to now be on one floor. I know that certtain thignss need to be in place for the future and using a wheelchair more in the future.. .but I don’t want it to look so “hospital” like. Ugh… lol. Feel so blessed bc familly and friends helping us to reaise money for htis… so lucky…!!!! We recently redid our bathroom and we actually salvaged the existing cabinet/vanity area due to budget constraints. We had basically replaced everything else…….. down to the subflooring….. but the reason I am posting on this article is that this is the one thing I really want to change now. We repainted it and all that good stuff…. so that it was still nice, but everything else is new so we’ve been looking. I want to replace the Vanity now and I will be checking out the Home Depot website in advance. Thanks! We desperately need a new bathroom vanity in our back bathroom. It has chips out of it and is a terrible pattern! These are great options. Thanks! Have been think of redoing my master bath. But will wait till after the holidays. We’re going to be going through a master bath renovation and I cannot wait to get it done!! Love the vanities, but I’m going to need a big one! Some great tips. And I love doing bathrooms, mainly because they are small and you can go a little crazy. And I love the HOme Depot and their DIY workshops, have learned a lot there. Love the black vanity pictured!!! Great ideas and love the variety of vanities!